Being an IBO for 45 years, achieving Crown level, and now serving on the IBOAI Board for his fifth term, has earned Bob Andrews the respect and appreciation of IBO leaders, Amway executives, and the Field. An inspiring leader and charismatic speaker, Bob frequently appears on stage at New Platinum Conference and Achievers, sharing bits of wisdom with IBOs that he, too, lives by: Learn from your Upline and mentors. Never compromise your principles. Build an attitude independent of circumstances. 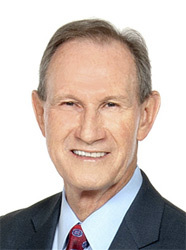 Bob has previously served as Chairman and Vice Chairman of the IBOAI Board. This year (2015), he has been elected to serve again as Chairman. He is enthusiastically committed to guiding the Board in fairly representing all IBOs. When Bob and his wife Terry became IBOs in 1970, their first "office" was the trunk of Bob's car, complete with an adding machine. Bob was 23 years old and Terry was just 19. Today the Andrews live in Florida, travel often, and spend time with family whenever possible. Their two sons are both married. Matt and Lindsay have a daughter and Cale and Aura have son.